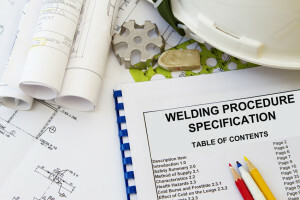 Welding is a special process that joins materials, usually metals or thermoplastics to dismountable connection of components. This process is widely represented in many engineering and construction companies as an integral part of the production process. As such, it must be well managed and supervised by welding supervision. Welding inspection is performed according to DIN EN ISO 14731 (in accordance with DIN EN ISO 3834-1 to 5, EN ISO 14 554-1 and 2, EN ISO 13214, EN 1011-1 to 8). Welding supervision is possible in most cases to provide the by external personnel and save the cost of a permanent worker. Welding supervision according to ČSN EN ISO 14731. The creation of welding procedures WPS. Preparation of welding procedure qualification WPQR. Control of production documentation and design to find the best solution. Selection of a suitable base and filler material. Staff training and supervision of the quality of welds performed during the manufacturing process. The creation of welding maps. Creating plans for nondestructive inspection of welds. Thanks to many years of practice, I can look at issues of welding in a broader context, not only EWE / IWE but also the project manager, employee quality and NTD worker and customer.